Albeit brief, I got a chance to chat with both designer Tory Burch and the Neiman Marcus fashion director, Ken Downing, yesterday at Neiman Marcus Houston! We got a sneak peek of her resort collection which is fab-u-lous. Great colors, prints, and some sneaky little accents like eyelet trim on shorts. Can’t wait to buy these pieces! Here are two pics from the event! Not the best picture of me, but Tory looked FAB! I’m so glad I got to meet her (and thank her tremendously) seeing as she sent me the bag I’m wearing to show off on the blog. I commented on her Louis Vuitton shoes (wish I had a pic to show you!) and she went off about how she loves mixing and matching designers. I love that about her, not afraid to pull pieces from other collections to complement her own – the shoes and her all TB outfit looked perfect together! Such a smart and inspiring lady. Don’t even get me started on Ken – he’s my new bestie. We ended up chatting for a while about Neiman’s seeing as my lovely sister works there and I spend a lot of my free time perusing the collections on every floor! He’s great and SO easy to talk to. 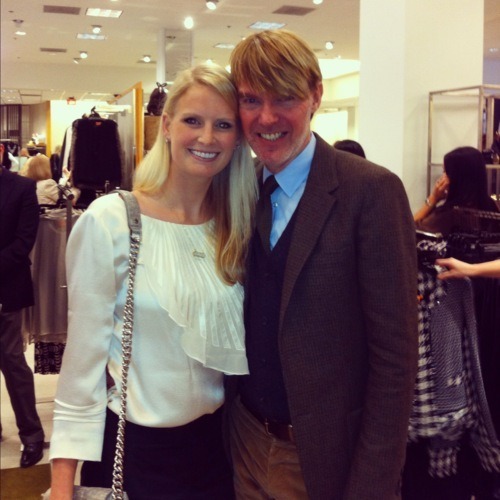 If you are ever at a Neiman’s event and see him, don’t be afraid to say hello, he’s a gem!